“Pacific Lady” now on sale at Audible! 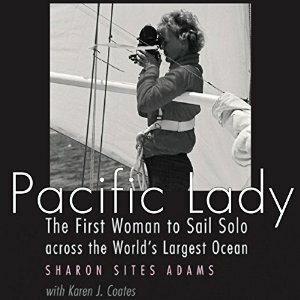 Lee Ann is very happy to announce that her recording of the nonfiction book Pacific Lady: The First Woman to Sail Solo across the World’s Largest Ocean by Sharon Sites Adams with Karen J. Coates is now available through Audible. “It was an age without GPS and the Internet, without high-tech monitoring and instantaneous reporting. And it was a time when women simply didn’t do such things. None of this deterred Sharon Sites Adams. In June 1965, Adams made history as the first woman to sail solo from the mainland United States to Hawaii. Four years later, just as Neil Armstrong very publicly stepped onto the moon, the diminutive Adams, alone and unobserved, finally sighted Point Arguello, California, after 74 days sailing a 31-foot ketch from Japan, across the violent and unpredictable Pacific. She was the first woman to do so, setting another world record. To listen to a sample and/or purchase the book, click here. Posted by lahowlett on December 16, 2015 in Uncategorized and tagged Audible, audiobook, Karen J. Coates, memoir, Pacific Lady, Pacific Ocean, sailing, sailing solo, Sharon Sites Adams.